Maybe it’s time to get some outside help. Finding your New Year’s sales projections already flatter than you hoped for? Doing all you know how to do with the personnel and financial resources? Everything is easier if you know how, and this Podcast might just be the answer you’ve been looking for to help you accelerate your sales. 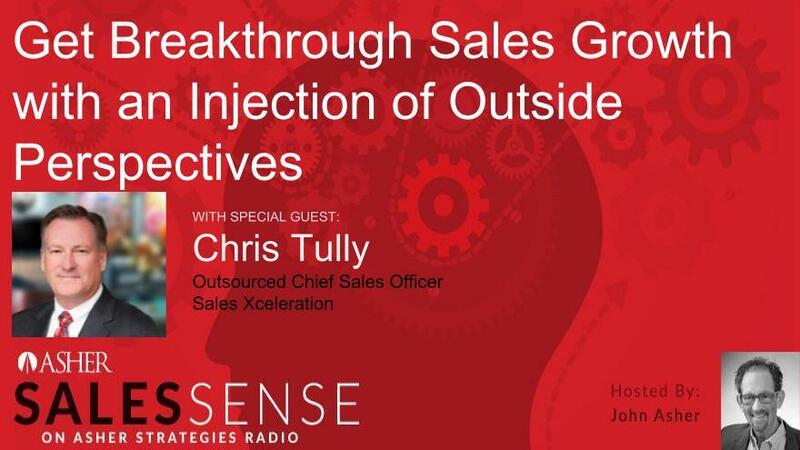 Listen to host John Asher and guest Chris Tully in their discussion on getting breakthrough sales growth with fractional sales leaders. "Interim sales management is less expensive, with managers that are more experienced, who fix internal issues of sales policies, procedures, incentive compensation and growth strategies." Chris is Outsourced Chief Sales Officer for Sales Xceleration, planning and executing revenue strategies for mid-sized growth-oriented companies in high-potential commercial and federal markets. He’s also a business advisor to the Association for Enterprise Growth, helping C-level executives and owners of small to mid-size companies achieve their business objectives. Topics covered during the program will include: using a fractional or part time VP of sales from an outside company to achieve breakthrough sales results; knowing the leadership skills a sales leader needs in order to be successful; and helping companies develop repeatable, effective sale processes. Listen in and get some new ideas on how to blow through your sales objectives! ASHER Strategies Has Improved Sales for Thousands of Companies.